This is a perfect costume and a performer’s ultimate dream. 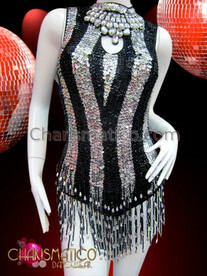 It is beyond ones imagination how enchanting this black and white crystal bra and skirt will look when different shades of stage light fall on it. 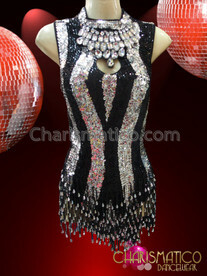 The big crystals at the center of the costume add further shimmer to the costume. Use of black and white organza makes this flame-ruffle tissue jacket shimmer like its made of smoke.